Okay, so the sign IS a little gaudy, but the food is GREAT! I am happy to report that the Supper Seven had little difficulty deciding where to eat this Friday. The vote was almost unanimous! Perhaps it was the miserable weather that gave us a hankering for some hearty Indian food. 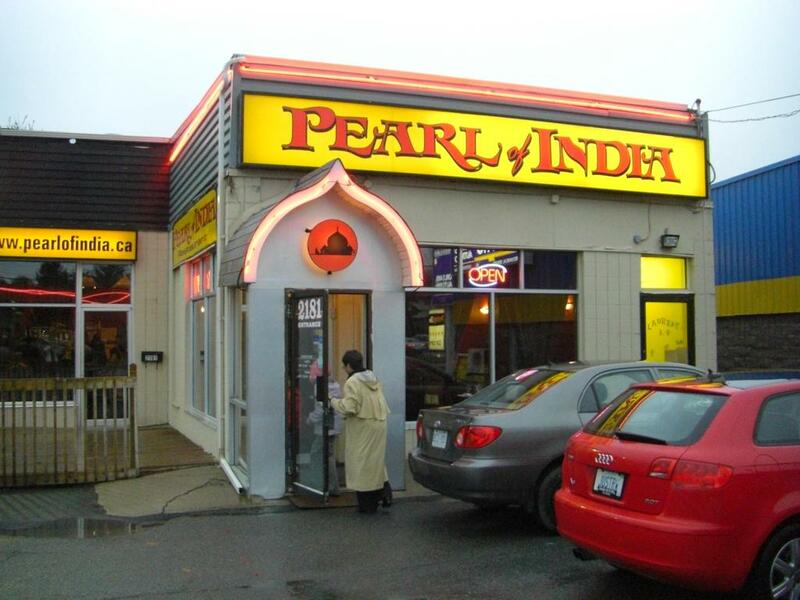 We have yet to find a better example in Ottawa’s east end than Pearl of India. It’s tucked away ignominiously in a body shop’s parking lot on St. Joseph in Orleans and if you are not paying attention, you will drive right by and that would be a shame. It is a testament to the quality of the food that the young girls, especially Amber specifically request that we go here. And it’s an easy choice because it’s exceptionally easy on the wallet. Our bill for seven including a couple of drinks and desserts was under $120! For under $20 a head we ended up taking some food home (it was definitely too good to waste)! During our early visits here, a few years ago now, we used to allow the staff to guide us in our selections and they always helped us select a good mix of dishes. Now, we are so familiar with the menu that we no longer need such assistance. This is one of those restaurants where we just order a bunch of dishes and then share them. A REAL Pearl – Not too Spicy or Pricey! So, can we go there again someday soon, dear? What we ordered: For starters, there are two soups on the menu, Daal (yellow lentil) and mulligatawny! Daal is mild, the mulligatawny a little spicier. Both are favoured by different members of our little group. The samosas are probably the best I have ever found in Ottawa/Gloucester, chock full of peas and potato and are served with a delicious sweet yogourt sauce. For the main course, butter chicken is an absolute must and liked by everyone. We normally order two dishes, but today we switched it up and picked a chicken tikki masala to replace one of them. It looks a bit like chinese sweet and sour dishes and was quite spicy (medium hot), but delicious nonetheless. Shrimp Bhoona with delicious sauce and lots of onion is another favourite. We typically order a lamb dish and this evening chose one that I probably cannot spell correctly because I think of it as Josh Groban (Rogan Josh). Another fairly spicy choice but Amber declared it the ‘best lamb we have had here’. Our server recommended the vegetable biryani and we acquiesced and were happy that we did. With all those other dishes having copious amounts of sauce and a paucity of vegetables other than onions and peppers, it was chock full of vegetables and a perfect addition. Finally, we ordered our favourite naan bread, which is one of the main reasons that we look forward to coming back here. Pearl of India knows how to make it just right! All we had left over to take home today was some naan bread (our eyes were bigger than our bellies!). I have taken a lliking to the ‘Indian’ Cheetah beer, but read the label today to discover that it was ‘Hand-crafted’ in Toronto. Now, I am not sure how one ‘hand-crafts’ a beer, but am pretty sure that Toronto is not Mumbai! Greg had his regular Gulab Jamun for dessert, though it is too sweet for most of our group but is often the only one available. Amber ordered ‘normal’ tea (2 others had Chai) and was disappointed that they had seen fit to add what appeared to be cardamom seeds, giving it an unwanted flavour and aroma! As usual, our affable host, obviously the owner, greeted us like long-lot friends and checked in with us several times to ensure that we were happy. Altogether, another very pleasant dining experience. Negatives: Poor dessert selection, no childrens’ menu. Summary: Of course, you have to like Indian food, because there is no North American food on the menu. Otherwise, we can find few flaws in this tiny gem of a restaurant. We’ll be back here soon!